This Fakra-to-SMB antenna connector adapter allows you to convert your factory-installed XM or Sirius antenna containing a single yellow Fakra antenna connector into an SMB antenna connector. This will allow you to use your existing factory-installed "sharkfin" satellite radio antenna with aftermarket XM, Sirius, and SiriusXM satellite radio tuner containing an SMB antenna jack. The Universal Fakra connector on this adapter is compatible with all pink, yellow, green, brown and black connectors. Looking to convert in the opposite direction? Also Available: Female Fakra (yellow) to Male SMB adapter cable. Only compatible in vehicles with an existing factory-installed XM tuner. 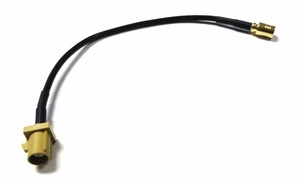 Vehicles that do not have an existing factory-installed XM tuner require the use of our XM Radio Factory Antenna Adapter for GM Vehicles.